Theres always a reason to celebrate...and at almost two feet tall, this lovely bouquet of blossoms in bright hues of orange, purple and red is the perfect way to do it! A classic floral arrangement for any occasion, and just right for any day of the year. 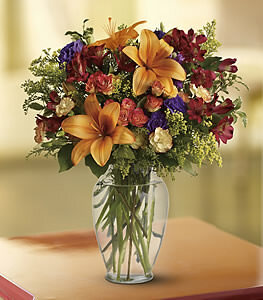 An assortment of fresh flowers such as Asiatic lilies, roses, carnations and lisianthus in shades of orange, purple and red - accented with greenery - is arranged in a clear glass vase.